Field Day, the River City ARCS’ premier annual operating event, is open to the general public. This live training session prepares amateur radio operators to be able to set up and operate a station during less than ideal conditions in an emergency. It is also a contest with points and awards for contacting other participants. The contest encourages all to participate, while the experience gained pays off when a real emergency occurs. With our influx of new and prospective amateur radio operators, an introduction to general operating procedures and the N3FJP software that we use to log contacts is in order. Our Field Day site will have several operating positions—each with a radio, antenna, 12 volt battery power source and a logging computer. Our Field Day Captain will coordinate each position to operate on a specific band and mode to avoid interference with each other. 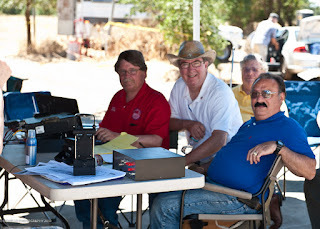 We encourage the general public and all licensed amateurs to come and get on the air. Anyone, including Technician class licensees, can also operate HF as General & Extra Class control operators will be at our Field Day site. Each position is ideally manned by a team of two—one does the operating and the other logs contacts on the computer. The team members can exchange roles and will appreciate occasional relief by other operators. To learn good communicating skills, observe a smooth operating team, then offer to help logging and/or operating. Field Day Rules: Read the full 2019 Field Day rules. We may contact other stations once on phone, once on CW (Morse code) and once on one digital mode on each band. We must log the other station's correct exchange information for the contact to be valid. This includes the station call sign, the number of transmitters at the site and class of operation, and the ARRL section. Our exchange information will be our number of transmitters (to be determined when we start), our class is Alpha (A for portable station with 100% emergency power), and our ARRL section is Sierra Victor (SV for Sacramento Valley). For example, if we have 4 transmitters, our exchange would be “Four Alpha Sierra Victor” on voice or “4A SV” on CW and digital modes. W1AW: “QSL 5A 5A CT CT"
Our software, the N3FJP ARRL Field Day Contest Log, networks the computers at all our positions, lists all the Field Day section multipliers (color coding those that have been worked), flags duplicate entries (contacts with stations on the same band and mode) and summarizes the activity for log submission. The Genesis ARC has posted this video tutorial of this software’s features. You will see how easy logging is when you see it at our Field Day. Field Day is a low stress way to get into operating a station, and there are plenty of experienced people willing to help the beginner. It is fun, you get lots of fresh air and good food—with priority given to the operators! 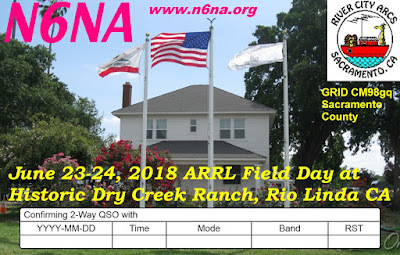 For review and further information we recommend the very informative slideshow “Field Day Made Easy” produced by the Newark, OH Amateur Radio Assn. 73 and see you at Field Day!